A couple of summers ago I worked at a camp and I became obsessed with tie-dying things. It got a little ridiculous. They had a whole tie-dye setup so I was really easy to dye whatever I wanted. At home, it isn't as easy. You can buy tie-dye sets, but they are a little more pricey than I prefer. And I don't want a whole setup, I just want to do one tie-dye set in the colors I choose, without spending a lot of money. For some reason I thought that using dye baths wouldn't give a very successful tie-dye look, but luckily I was wrong! 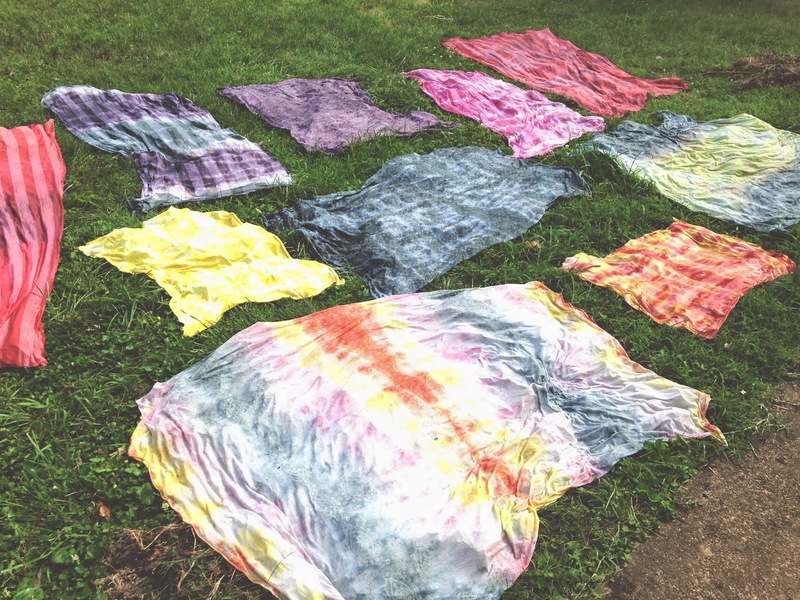 This is by far the cheapest way to tie-dye a bunch of fabric. I did about 8 yards and spent around $2 on the dye. 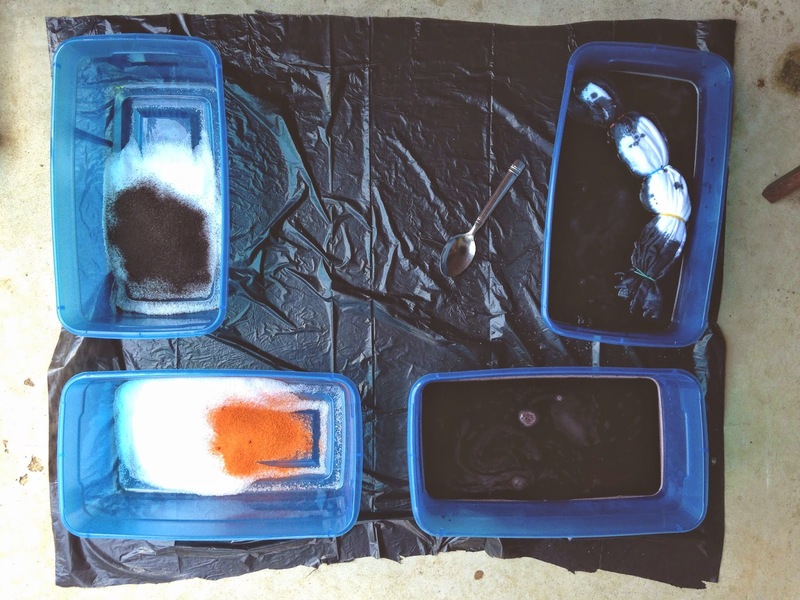 You will need some dye powders in the colors of your choosing, white fabric, rubber bands, salt, hot water, buckets, and gloves if you'd like to keep your hands clean. I layed my fabric out and just gathered it from side to opposite side, crumbled it up and put a rubber band around that section. I repeated this up and down the length of the fabric. I didn't want to do anything really fancy with the rubber bands, I wanted a simple tie-dye look/pattern. To start, add 1 cup salt to each container. 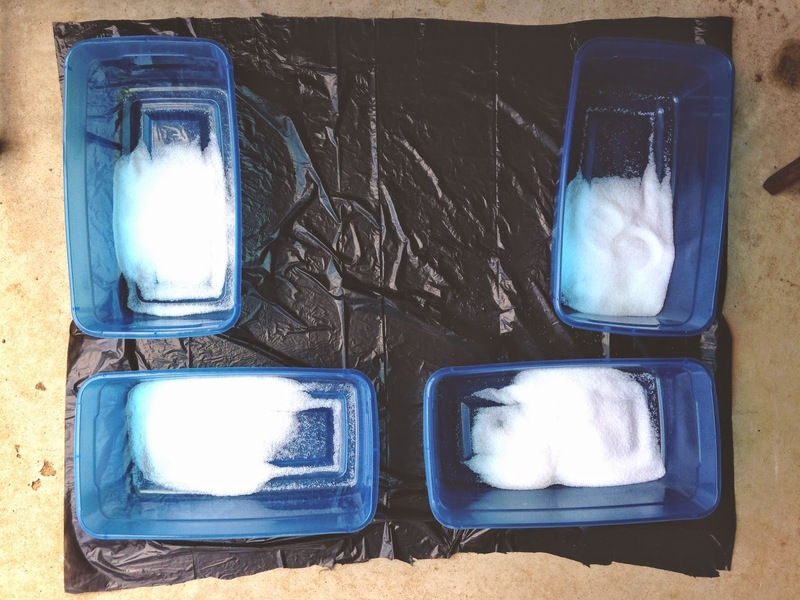 This helps the fabric absorb the dye better. Next add your dye powder and the hot water. Look on your dye for instructions on the right amount of water. Stir the mixture until the salt and dye is dissolved. 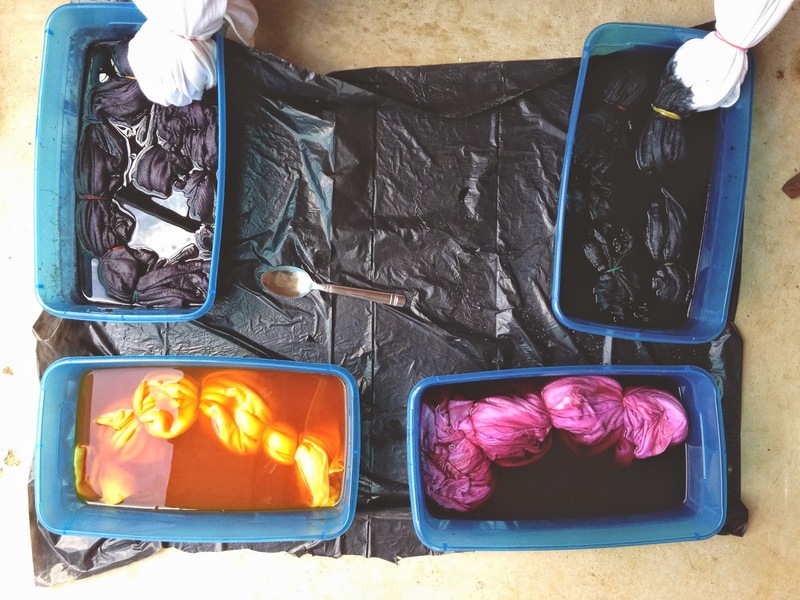 Put your tie-dyed fabric in the dye bath. If you want the fabric to be all one color, submerge it completely. Otherwise, only put half of it in the bath and leave some of the fabric out. Another method is dye the fabric completely in a light color, rinse it out and then re-tie it and dye it again in a darker color. I did this with a couple pieces of fabric and it worked really well. 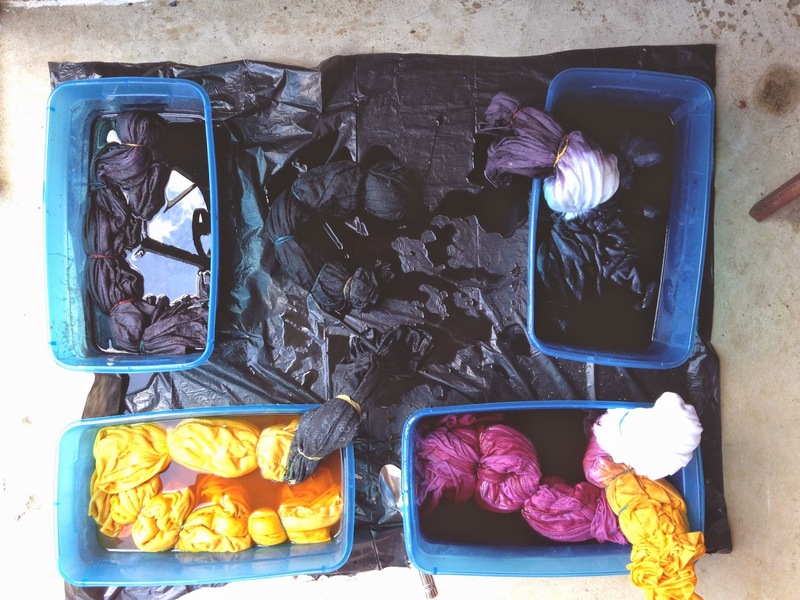 Leave each piece in the dye for the amount of time your dye recommends. I left mine in for 20 minutes each. Next, just cut off all the rubber bands and rinse each piece of fabric with cool water. I put my fabrics out in the sun to let the dye set in a little more before I washed them. There was still dye in mine after washing them out for a while. After this, I washed them with like colors in the washing machine. I will be making some kimonos out of these whenever I get a chance! And a few of these we have taken to the beach to lay on. Love 'em all! I don't know what it is, but I really like tie-dye. A little too much, I know. These are awesome!!! 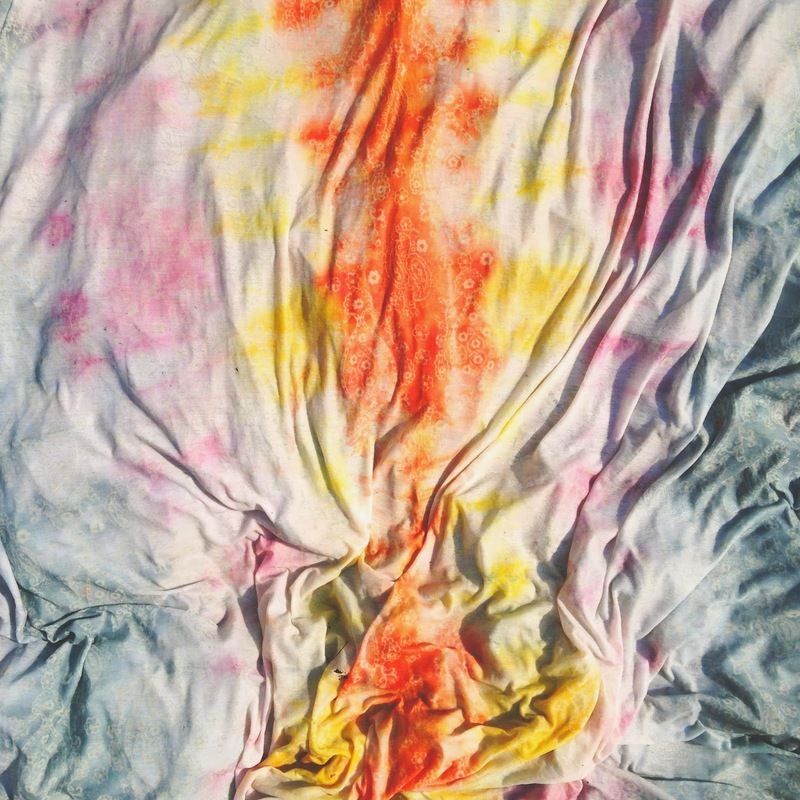 (And there's no such thing as too much tie dye love. ;) I'm obsessed with it too!) I cannot wait to see the kimonos - that is such a fantastic idea! !